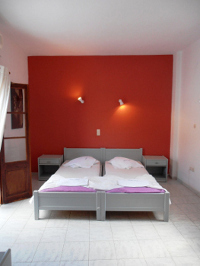 Kiki Hotel is a C' class hotel located in Kamares 200 m. from the sandy beach. The seaport tavernas of Kamares, shops, a few bars and a bus stop are all nearby. All rooms (15 units) have air-conditioning, TV, telephone, mini fridge, and balcony or veranda. Some of the rooms offer a sea view. The hotel also offers a reception area, TV room, indoor and outdoor breakfast lounge, and parking space.